This Friday night I attended the opening of Shock and Awe at the Royal West of England Academy, an exhibition of contemporary artists “at war and peace”, curated by Paul Gough. I suspect it was originally intended to commemorate the centenary of the First World War, but as the exhibition’s name suggests, it was the Iraq War which featured most prominently. That so much of this exhibition should touch upon Iraq is not remotely surprising. It is the most destructive and ruinous war we have fought since World War Two; it was an illegal war of aggression; it was war facilitated by lies and deception at the heart of government; its architects remain at liberty and much enriched. Most of all, this country’s cultural fabric and its body politic, its most basic sense of self, has never really been able to accept what we have done. We know, of course, individually all of us know, bar the wilfully ignorant or those locked in deep denial, but we lack any collective way of acknowledging this, let alone acting on it. In terms of collective acknowledgement, our best hopes may lie in our art (or the arts). Artists are supposed and obliged to expose precisely this sort of cognitive dissonance as it affects society; their status as reflective outsiders gives them the necessary perspective to do so. In art we can see the wounds and dysfunctions of society, just as much as its hopes and strengths. This is practically a platitude, and it’s entirely unnecessary to provide examples, but I’m thinking of Otto Dix, or Goya; people like that. So what is striking about Shock and Awe, really, is that the Royal West of England Academy is not an avant-garde institution. It is, if anything, conservative, traditional, and establishmentarian. That is not intended as criticism but as important context, because what struck me is how widespread our anger over Iraq is, and how for the most part our institutions have failed to express it. Our civil service, our media, our courts, our military, the government and the whole machinery of our democracy; our social institutions, as Karl Popper would have described them, have fallen into collective silence, or even embraced active duplicity, as regards the reality of the Iraq War. Only in art are the views of the people expressed. I say “the people” in the most literal sense. The millions of people who protested reflected the majority of those who less obviously opposed the war. In turn, many of those who supported it now feel they were wrong, and are brave enough to say so. Every time I have spoken about my David Kelly biography at a festival or engagement, I have spoken to a room full of people. All of them know the war was wrong. They come from all walks of life – although I was astounded to meet someone who had worked, in a senior position, at GCHQ, who told me he had gone on the Stop The War march in 2003. 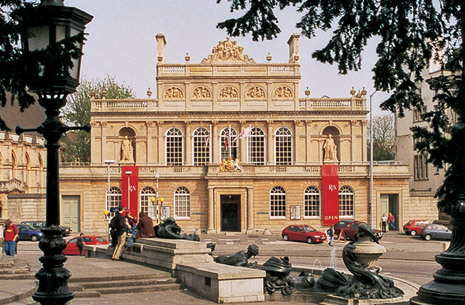 And so, although the Royal West of England Academy may be seen as somewhat staid by its younger rivals, it has done a decent and important job of expressing popular disgust over our Britain’s role in the conflict. Sadly, the Royal Academy on Picadilly has yet to host a similar show, and its First World War exhibitions remain focussed entirely on the work produced by that conflict and no other. How dull, how safe, and how typical. A few years back the Iraq Triptych by Michael Sandle was given prominent display during the “open” annual summer season, and ended up winning the Hugh Casson prize for drawing, but this was as near to the bone as the RA in London has got. At the RWA I was struck by Jill Gibbon’s sketches from the various arms fairs she has infiltrated, which offered fleeting glimpses into a hideous world. Trade fairs are always terrible events, but Gibbon’s arms fairs combine the dull, hard-drinking, portly chauvinism of the conventional conference with the hellish reality of violent, arbitrary, civilian death. Her hastily drawn outlines (all sketches were covert and in situ) of beaming, bikini-clad women posing for fat, swinish businessmen, in order to flog cluster bombs and phosphorous shells, provided the most shocking work of the show. Other artists provided work that was, fittingly for a Royal Academy, more institutional in its effect: this is what we think, this is what we are. While this academic trait can be stifling in other circumstances, it seemed vital here, given the subject at hand. The work of the late Richard Hamilton was here too, but only a single commemorative medal, commissioned by the British Art Medal Trust for the Medals of Dishonour exhibition at the British Museum in 2009. As it happens, that exhibition was another rare and amazing example of a British institution reflecting the reality of our guilt over the Iraq War. Hamilton’s piece was titled the Hutton Award, with Blair on one side and Campbell on the reverse. CONFIDIMVS DEO DE ABSOLVTIONE: MMIV the inscription runs, above our former Prime Minister; DIALBATI, it declares, above Campbell. This, as you might imagine, was something that took my interest. 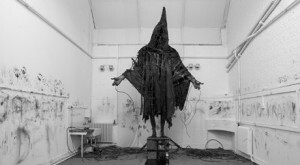 The focal centrepiece was undoubtedly Casting A Dark Democracy by Academician Tim Shaw, a sculpture of at least twelve feet in height, made from steel and black bin bags: a reproduction of the what was perhaps the war’s most iconic image: the hooded prisoner at Abu Ghraib, stood on a box, his arms raised, with electrodes on his fingers. It was not until I saw this that the exhibition really moved me to anger. The other exhibits reflected only what I had thought and felt for years, but was unable to read in any newspaper, or see on any television screen. This was different, because of its inversion of place. Standing before it I was soon reminded of the commemorative sculpture of other conflicts. Casting A Dark Democracy was a similar scale, it had a similar permanence (despite its polythene shroud), and it too spoke of the dead in a far-off land. Yet while the sculptures that memorialized the Great War typically possess a great humanity and restraint, they express not just loss but emotional restraint, stoicism, and nobility, they evince sacrifice and nobility. Sometimes, yes, there is a wonderful muted anger, but more often we have the downcast faces or the quiet contemplation of the bronze Tommies of the Royal Artillery Memorial at Hyde Park Corner. After the 1918 armistice, the Unknown Soldier was given form, in a way that makes us feel better. How different is Shaw’s sculpture to that idea. Dare I say, Shaw is precisely the sort of sculptor who, in an earlier age, would have made such art. He is a trusted, establishment-type professional, a member of the RA, an artist more inclined towards traditional form than conceptual innovation, and again, this is in no way intended as criticism. But what has happened to our government and our country in recent years has forced Shaw away from that safer form of expression and into potent criticism of the state. 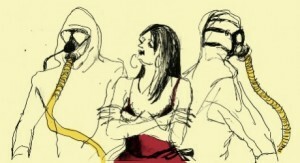 All Iraq War art is much the same: it can portray only victims and criminals. When the time comes to build our own Iraq War memorials, the commissioned sculptors, if they are any sort of artists at all, will have no choice but to follow suit. There will be no dignity to our remembrance. That was the first cusp of my anger. The second was when I realised, very quickly, that art is not enough. There is even a sentimental decadence to such art, a woe-is-us inadequacy. Because the hooded prisoner of Abu Ghraib is not the Unknown Soldier. He is a real man, and his name may be Ali Shallal al-Qaisi, but nobody knows where he is now, or what happened to him afterwards. There is a real person behind this icon, whose suffering and restitution, if any, is unknown. If we can make a sculpture, if we can profit from his image, perhaps the least we could do is try to find out. We live in an age of images, and we forget too often the chasm between image and subject. Also exhibited was Katie Davies’ excellent video art The Separation Line, which was the best work of the whole show. 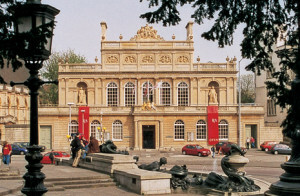 In the adjoining gallery was a collection of paintings by the Nash brothers, and oddly enough, only a few doors down at the Bristol Museum, was Jeremy Deller’s wonderful English Magic, fresh from the British Pavilion at the Venice Biennale, at which David Kelly and Iraq constituted an important element. I hope to write at greater length about these things in the near future; either here or elsewhere. Just came across your review of Shock and Awe, at the RWA last year. I thought that it was a very good piece of writing and yes Kate Davies piece was truly excellent. But you ran out of steam ? ?More should have written more about this work. Your doing good things by the way with your writing. Thanks for your comment. I could and should have written more about all of it. The further social narratives stray from the truth, the more powerful art can become. But I can see, after only a moment’s thought, that I have described you somewhat unfairly. What I have done is confuse your medium, and your materials, with you as an artist. Apologies for any projection. But the heavy metal casting behind Casting A Dark Democracy (the inherent pun only occurs to me now, sadly) powerfully evokes – and subverts – that earlier strain of civic, municipal, hegemonic statuary. It was a shame I missed your show last year. There is so much more I would like to do and see. I appreciate your words of encouragement, and I look forward to finding out more about your work.